After winning so often in WorldSBK recently, even scoring truly battling second places, and no fewer than six of them in succession, cannot really satisfy a four-time World Champion like Jonathan Rea. The Northern Irish rider once more had to give best to Bautista and Ducati, and he even had to keep one eye out behind for the closely-following Alex Lowes, in both the short and long Sunday races. “The best we could hope for today was a brace of second places and we managed to achieve that, albeit with a lot of pressure from Alex in the final race. 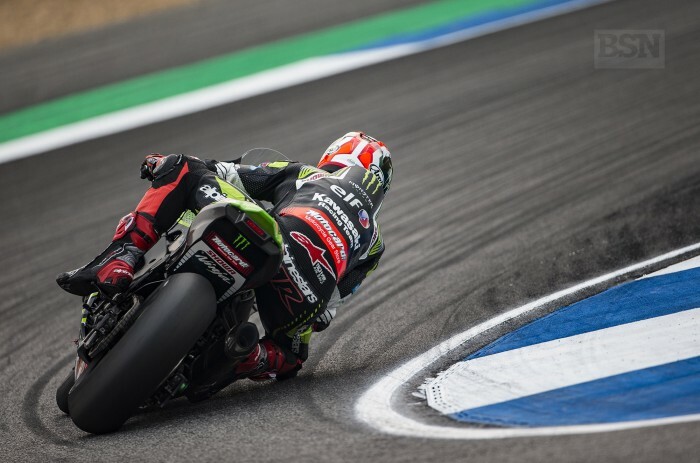 He kept really pushing, as he had in the sprint race, but I just had that little bit extra in the end of race three to go away,” Rea told bikesportnews.com. Rea’s little extra at the end of the third race was also a slight slowing of Lowes, who had been a constant threat in both Sunday races. “It just seemed like he dropped a little bit more than me. I was able to, right at the end, stay in the low 1’34s at a push and then when I saw the gap going up I could roll off a little bit and manage my pitboard. It was not the most beautiful race but behind my visor I was giving it 110 per cent, especially in those early laps to try and keep in the slipstream as long as I could. Rea is also keen to state that his bike, and his own showings, are actually better than last year. It is just Bautista running away out front on his own. “Of course we have improved. I feel like the race times are much faster than last year, and we have definitely improved our package. When asked how frustrating it was to be riding maybe better than ever, and on a better bike than ever, and still being second six times – especially after being used to winning so much – Rea said, “It is very true, I have to get used to not winning. “I do not want to get used to it but right now Alvaro and Ducati are the reference. I feel mentally very strong, very good, but I accept the situation the way that it is. It is plain to see, but I will keep on doing my thing. I just hope that there will be some tracks that suit us. Of course everyone is talking about the speed of the Ducati but Alvaro is doing a great job to keep the pace to the end of the race like he is. Rea allows for the fact that there may be some good tracks for him coming up, but he is also non-commital about the immediate future and its prospects for more. “It is very difficult to say right now, but every weekend we will go into with new motivation to try and convince ourselves we can do a good job, like we did this weekend,” he stated. “Right now we need to chase down that gap. It is a very long season, and I understand how to put a season together. I have been in this position before where I have been chasing and a position where I have been leading. Rea was dismissive of the effect a possible drop of 250rpm may have on the Ducati, if it turns out that way after the balancing rules are brought into play after three rounds. “250 is peanuts. I do not know, I am not a technical guy, and I do not understand how it would affect their bike.